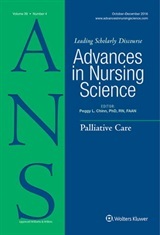 New ANS issue just published! ANS 37:4 was just published! This issue contains Part II of our focus on “Health Equities.” Both of these articles address equities related to specific populations – African American mothers living with HIV, and children with mental health symptoms. 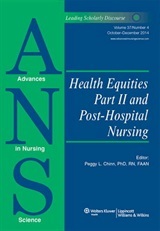 The planned topic for this issue – “Post-Hospital Nursing” is one that is becoming increasingly significant for nurses, as health care shifts more and more to the home and the community. Each article in this issue will appear on the ANS blog with messages from the authors, inviting you to engage in discussions of their work. Join us in this conversation! Here is what you will find in this issue!